Gotham's version of The Joker has just received some high praise from Mark Hamill. Gotham has introduced a ton of character's from Batman's rogues gallery throughout its run. Cameron Monaghan portrays Jerome who, while technically not referred to as The Joker on the series, clearly serves as a precursor to the famed Clown Prince of Crime. 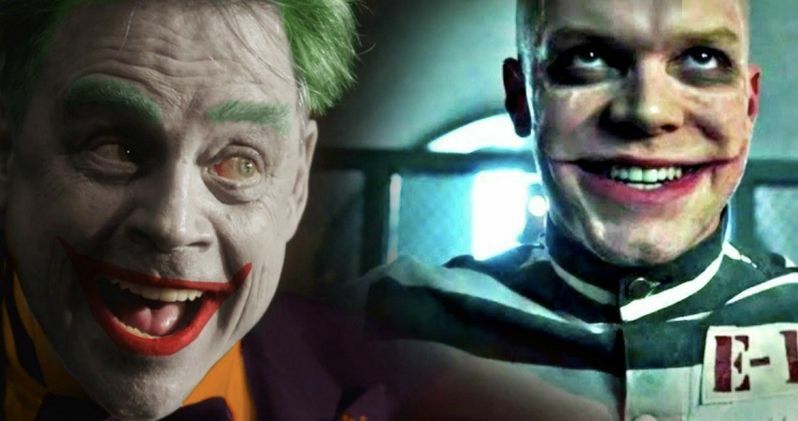 Many DC fans are quite happy with his portrayal and now, you can add Mark Hamill, who is very closely associated with the role of The Joker himself, to Monaghan's list of fans. Taking to Twitter, Mark Hamill decided to heap some unsolicited praise upon Cameron Monaghan and his take on The Joker. Or "Jerome," but really, this is pretty much Gotham's Joker at this point. In any case, Hamill is quite impressed with what the young actor has been doing with the character on the Fox series and said as much in a recent retweet of a clip from an upcoming episode of Gotham featuring Monaghan showing off his skills. Hamill also manages to slip in a reference to Batman: The Killing Joke. Here's what he had to say. "Can't wait! @cameronmonaghan is KILLING IT as #TheJoker & that's NO JOKE." Mark Hamill, outside of playing Luke Skywalker in Star Wars, is best known for voicing The Joker in Batman: The Animated Series, as well as a great many other Batman projects over the years. Even though he only voices the character, many consider Hamill's take on the character to be one of, if not the best portrayal of the beloved DC villain ever. So having him praise Cameron Monaghan's character on Gotham shouldn't be taken lightly. Cameron Monaghan's transformation into Gotham's version of The Joker has been something of a slow burn. DC fans are used to just seeing The Joker be the Joker. Part of what makes the character work is that his backstory is shrouded in mystery. But getting to see the transformation take place is certainly part of what adds to the appeal of a show like Gotham in the eyes of fans. Mark Hamill being one of them. It's not all that surprising that some fans wanted to see him play Carnage in the upcoming Venom movie. A casting choice that Monaghan himself was into. Monaghan took to Twitter to acknowledge Hamill's praise, referring to him as the "master." "High praise and a true honor coming from the master himself! Thank you, good sir." While Heath Ledger's performance in The Dark Knight has certainly become the most iconic take on The Joker over the years, Mark Hamill has played the part many times. He knows the character very well and that likely makes this unprompted praise pretty special for Cameron Monaghan. Gotham returns to Fox with new episodes on March 1. Be sure to check out the exchange from one Joker to another, courtesy of Mark Hamill's Twitter account, for yourself below.